Locals often say “it’s only a 20-minute drive to nature from Anchorage”. 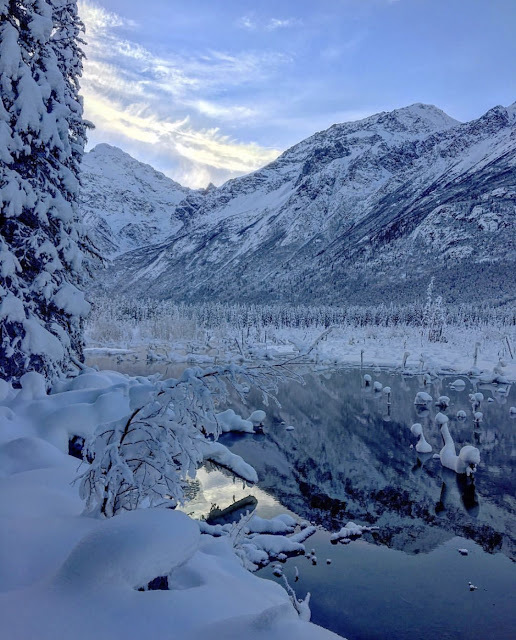 Anchorage has access to one of the biggest state parks, the Chugach State Park and Chugach National Forest. There are tons of hiking trails for all different types of fitness levels and there is something for everyone. About a 40-minute drive south of Anchorage is one of my favorite hikes. It’s about 2.3 miles one way and you gain a little over 3,200 feet of elevation. 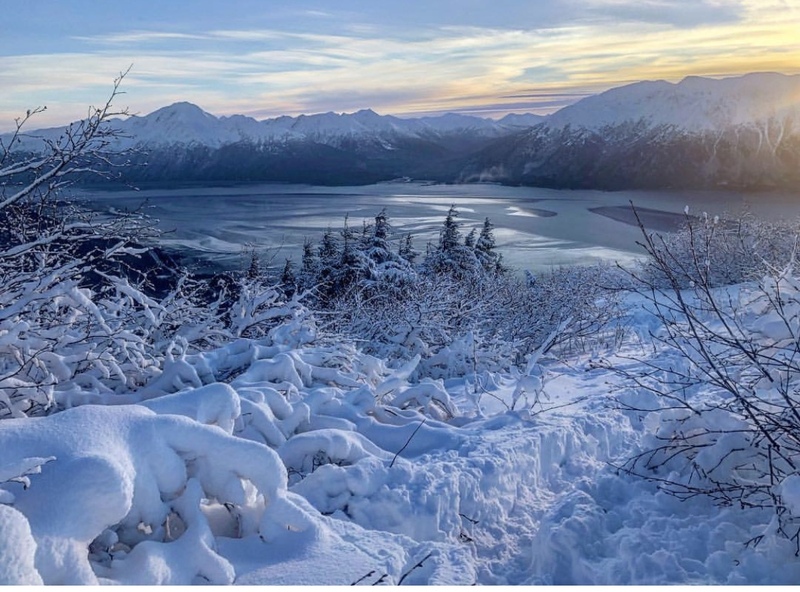 Though it is one the most challenging hikes it rewards you with instant views of the Turnagain Arm and surrounding mountains. Even if you only hike up halfway, you are greeted with 360-degree views. On this hike, you can view the bore tide which happens twice a day where you see one continuous wave cross the Turnagain Arm. In the summer, you can find locals surfing the wave. You will have to check tide charts to see when the bore tide occurs. This is a great hike to do for those who are not used to hiking up elevation or just want a nice hike in the woods. Albert Loop Trail is located at the Eagle River Nature Center. About a 35-minute drive north of Anchorage. It’s a 4.5-mile loop that is pretty much flat and you have great views of Eagle River and the mountains. Along with this hike, you will pass some public use cabins and Yurts which are available for the public to rent. There are some platform decks for wildlife viewing. In the winter this place is magical and looks like you are in a fairytale. In the fall, this a great place to view the fall colors. This is a popular trail overall, but in the summer they do close the trail off during August-October due to bears feeding off the spawning salmon in the river. If you want to see glaciers, then Portage Glacier is your go-to-glacier. It’s the most accessible glacier in the Chugach. It’s located about a 1-hour drive south of Anchorage. In the summer you can get to Portage Glacier via Portage Pass in Whittier. You have to enter using the Whittier Access tunnel which is a one-way tunnel. The tunnel direction changes every hour so you have to look at the schedule on the State of Alaska website. Portage Pass is a 4-mile hike with 1600 feet of elevation gain total. It’s not that hard of a hike the first mile you climb 800 feet to the pass then down back 800 feet to Portage Lake where you can get a close-up view of the glacier. This is a moderate hike but just getting to the pass is worth it along. Though, the winter is where portage glacier stands out. If the weather cooperates and is cold enough, Portage Lake would freeze and you can actually walk on the lake to Portage Glacier. It’s about at 4 miles flat hike to the face of the glacier. It’s a beautiful walk on the lake and once you turn around the corner of the lake you see the beautiful Portage Glacier. You don’t have to enter Whittier because you can access the lake from the Bear Valley side. There is a visitor center. Sadly due to global warming, you can no longer see the glacier from the visitor center. There are some options to still see the glacier. It just requires a little bit of a hike! Summer: Though the Chugach is a beautiful place to explore you have to be aware and prepared for going out in nature. You have to be aware of wildlife. There are bears and moose where you have to be careful. Bring bear spray when hiking in Alaska. Make lots of noise so you don’t startle wildlife. Always try to hike in groups. Bring lots of water, food, and deet for the mosquitoes which can get pretty bad in the summer. Winter: Though you don’t have to worry about bears. You have to be aware of the temperatures and avalanche danger! Dress in layers! I always wear an underlayer, mid layer, and an outer shell. Bring warm clothes because Alaska weather has a mind of its own. NOTE: Written by Ted Odena, Guest Blogger.